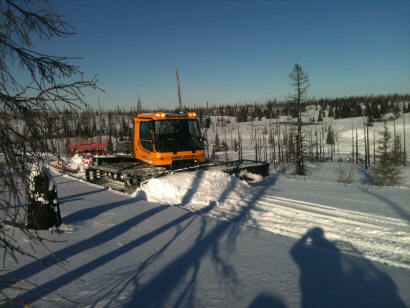 Please keep in mind the trails were groomed Tuesday and Wednesday this week. Subsequently we had some winds and snow resulting in some drifting, be aware. The ice bridge on Deep Creek at the bottom of 126 Trail has gone out, the ice bridge on Deep Creek had gone out and was rebuilt on Tuesday and so far is intact. We’re staring to get more spring like warm temperatures so ice bridges are beginning to get soft, again, be aware, thanks. Hope to see everyone at family fun day, tomorrow 3/16 at Freddie’s Roadhouse!